The pullback in Medicare acceptance is being felt in certain quarters. Joe Baker, president of the Medicare Rights Center, said his patient-advocacy group has had an increase in calls from seniors who can’t find doctors willing to treat themmainly from affluent urban and suburban areas where many patients can pay out of pocket if their doctor doesn’t accept Medicare. “In most places, doctors can’t pick and choose because Medicare is the biggest game in town, or the only game in town,” he said. Some experts attribute the rise in defections to Medicare payment rates that haven’t kept pace with inflation and the threat of more cuts to come. Under a budgetary formula enacted by Congress in 1997, physicians could see Medicare reimbursements slashed by 25% in 2014 unless Congress intervenes to delay the cuts, which it has done several times. “Medicare has really been pushing its luck with physicians,” said economist Paul Ginsburg, president of the nonpartisan Center for Studying Health System Change. “By allowing the SGR and its temporary fixes to persist, Medicare is risking a backlash by senior citizens who say, ‘Hey, this program isn’t giving me the access to doctors I need.’ .” Some doctors say Medicare’s reimbursement ratesas low as $58 for a 15-minute office visitforce them to see 30 or more patients a day to make ends meet. “Family physicians have been fed up for a long time and it’s getting worse,” said Jeffrey Cain, president of the American Academy of Family Physicians. By disengaging with Medicare and other third-party payers, he says doctors can practice based on what patients need, not what insurers will pay. Other doctors are dropping out of Medicare to avoid deeper government involvement in medicine, much of which is occurring in Medicare. For example, Medicare is now paying incentives to doctors who switch to electronic medical records and who send data on quality measures to the federal government. Doctors who are part of the Medicare program who don’t do so will face penalties starting in 2015. The numbers of patients seeking appointments is expected to double over the next 25 years driven by the ageing population with more people falling ill. Experts say the only way the NHS will be able to afford to care for all these people is by charging for some treatments and services which are free. Overloaded: Doctors want payments introduced to put off time wasters, according to a poll of 440 GPs carried out by Pulse magazine. But some fear that fees will discourage sick patients from seeking the help they need But some senior doctors and campaigners fear that fees will discourage sick patients from seeking help. 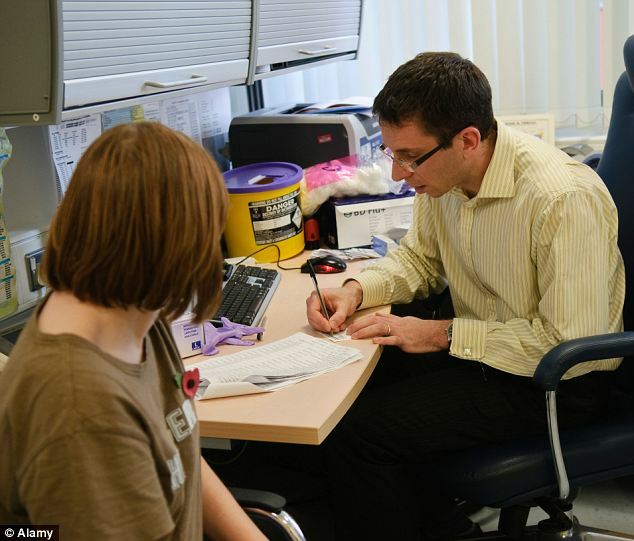 A poll of 440 GPs by Pulse magazine found that 51 per cent were in favour of making patients pay a small fee for routine appointments. The majority said the charges should be between 5 and 25 per appointment but one anonymous doctor called for means testing with the wealthiest patients paying 150. Blood pressure drugs may boost brainpower: Side effect of medicines slows dementia patients’ mental decline Dr Shailendra Bhatt, a GP in Hemel Hempstead in Hertfordshire, said: I work in a walk-in centre. The amount of people who come through the door for practically no reason at all and say I was out and saw this sign for a walk-in centre where one can see a doctor, so I came in. People dont value the things if they get it cheap, worse still if they get it for nothing. And one anonymous GP said: Charging must be introduced. Amongst many others I have one patient who made 116 appointments in a 12 month period. We tried many, many avenues of reducing them, and guess what happened she went and complained to the ombudsman. Value for money: The majority of doctors backing charges said they should be between 5 and 25 per appointment but one anonymous doctor called for means testing with the wealthiest patients paying 150 The Patients Association said that any charges would threaten the founding principles of the Health Service. Chief executive Katherine Murphy said: The NHS was founded on clinical need, not the need to pay and is meant to be free at the point of use. NHS REJECTS DOCTORS’ PLEA TO DOUBLE PAY ON WEEKENDS A request by doctors to be paid more for working in A&E out of hours has been rejected by the NHS. The College of Emergency Medicine, which represents casualty doctors, wants the hourly rates for overnight shifts to be raised to make the profession more attractive. And clueless, too. A new survey shows that an overwhelming percentage of physicians don’t believe that their states’ new health insurance exchanges will meet the Oct. 1 deadline for those key Obamacare marketplaces to begin enrolling the uninsured. Just 11 percent of doctors believe those exchanges will be open for business that day. More on CNBC: — Patients often get charged more for less But those doctors, by a wide margin, also said they are “not at all familiar” with how a number of important aspects of those exchanges and plans offered on them will workaspects that will directly affect their bottom lines. More than 65 percent of them gave that answer to all but one of the questions asking their familiarity with plan benefits levels, contracted rates with insurers, patient coverage terms and the claims process. “Doctors, they’re seeing patients and they don’t have time or motivation to get up to speed on this, but they’re going to have to because it’s going to impact them.” Jackson said that the “the major lack of awareness” among both doctors and patients “is troubling.” Please rate your familiarity with the following aspects of state insurance exchanges: How the policies purchased from state exchanges will impact your business: Extremely familiar: 2.84% Slightly familiar: 13.22% Not at all familiar: 70.48% LocumTenens.com polled 479 independent physicians for the recent survey, which had a margin of error of plus or minus 4.3 percent, with a 95 percent confidence level. Doubts about exchanges Those doctors, on average, believe they will see a 13.4 percent increase in the number of patients coming to their practices after the state health exchanges go into effect. Those exchanges, a pillar of President Barack Obama’s healthcare reform law, are being set up to enroll uninsured people, many of whom will receive government subsidies to purchase insurance from companies that choose to sell plans through the marketplaces. But more than 55 percent of the doctors don’t expect the exchanges to begin enrollment as scheduled this fall, and 34 percent don’t know if the enrollment will begin on timea degree of skepticism that tracks overall cool or negative public opinion about Obamacare. Jackson said he was “amazed” that just 11 percent of doctors were “saying their exchanges would be ready.” A huge number of doctors89 percentsaid they believed that consumers had not been adequately educated about how the exchanges’ policies will function, and more than 9 percent didn’t know if there had been adequate education of consumers. The issue relates to a large number of Indian doctors, who fear an institutional bias may be behind them unfairly failing GP exams or receiving lower pass rates despite extensive training and knowledge. GMC, the doctors’ watchdog in the UK, has now begun an independent data review into the pass rates for internationally-trained and British-trained ethnic minority medical graduates taking the Royal College of General Practitioners (RCGP) exams. According to RCGP figures, the failure rate for British medical graduates of South Asian origin is 17.5 per cent and for black candidates 24.4 per cent, compared with 5.8 per cent for white candidates. “This is a critical examination for doctors wishing to become GPs and it is vital that doctors, patients and employers have confidence that it is both fair and robust. Where serious questions have been raised, as they have in this case, it is right that we should look at them,” said Niall Dickson, chief executive of the GMC. The review will also look at the Clinical Skills Assessment (CSA), a practical and knowledge-based test introduced in 2010 in which candidates treat decoy patients. It takes three years to train to become a GP after gaining a degree, and in their final year medical graduates must pass the CSA before they can qualify. RCGP figures show that 65.3 per cent of foreign-trained GPs failed their first attempt at the CSA in 2011-12, compared with 9.9 per cent of medical graduates who studied in the UK. The highest failure rates taking the GP exams are for candidates trained in South Asia, with 69.4 per cent of candidates failing their first attempt at the CSA. RCGP has denied charges of bias and welcomed the review. British International Doctors Association (BIDA) chairman Dr Sabyasachi Sarkar , had written to the GMC that “the failure rate is simply staggering.” The British Association of Physicians of Indian Origin (BAPIO), which represents Indian-origin doctors working in the UK, has been campaigning for a probe into the disparity in results for over two years. “We want fairness and equal treatment for the IMG (international medical graduate) trainees. For the qualifying bodies, it should be an extremely worrying point if a large number of trainees from a particular background are failing, despite most successfully completing three years in training under supervision and actually servicing live patients,” said BAPIO president Dr Ramesh Mehta , himself an examiner. Indian doctors have been long considered the backbone of Britain’s National Health Service (NHS), with over 25,000 practicing in the UK. “These IMGs continue to endure immense strain on their families, creating personal anxiety, stress and financial ruin, having spent tens of thousands of pounds on exam fees and courses. All this is because of unfair assessment,” said BAPIO vice-president Dr Satheesh Mathew . Here, too, the aim is to have clinical associates take on more routine medical exams, diagnostics, and treatment plans so that physicians can focus on the more complex cases and highly specialized tasks. The South African government has established a minimum target of placing five clinical associates in every district hospital. PAs in Ghana have two models, one that emerged by upgrading health worker training programs and a second university-based academic training model. Recognizing the great need for health care in their country, the government is now working to integrate both models into the countrys health care system. Asia The PA profession is also emerging in Asia, where in India PAs are assisting in complex surgeries in for-profit hospitals, and Saudi Arabia has worked with a US hospital system to create a PA program within the military system. Elsewhere, on a province by province basis, China is considering many possible roles for physician assistants. One role, for example, would be to care for the large migrant worker population of rural residents who move into large urban centers to staff high tech and clothing factories. Japan is also interested in engaging physician assistants to increase the efficiency of surgeons in high tech specialties such as cardiac surgery. Conclusion The emergence of PAs around the globe is not a coincidental happenstance. Thought leaders from many countries and every continent are exchanging ideas, coming together to share successes and talk through challenges. Thanks to their efforts, around the world physician services are being extended through partnerships with PAs, and access to care is improving. A few showers. No Cookies To use this website, cookies must be enabled in your browser. To enable cookies, follow the instructions for your browser below. Enabling Cookies in Internet Explorer 7, 8 & 9 Open the Internet Browser Click Tools> Internet Options>Privacy>Advanced Check Override automatic cookie handling For First-party Cookies and Third-party Cookies click Accept Click OK and OK Click Tools>Options>PrivacyOptions>Under the Hood>Content Settings Check Allow local data to be set Uncheck Block third-party cookies from being set Uncheck Clear cookies Enabling Cookies in Mobile Safari (iPhone, iPad) Go to the Home screen by pressing the Home button or by unlocking your phone/iPad Select the Settings icon. Select Safari from the settings menu. Select ‘accept cookies’ from the safari menu. Select ‘from visited’ from the accept cookies menu. Press the home button to return the the iPhone home screen. Select the Safari icon to return to Safari. Before the cookie settings change will take effect, Safari must restart. To restart Safari press and hold the Home button (for around five seconds) until the iPhone/iPad display goes blank and the home screen appears. Select the Safari icon to return to Safari.